The British Seagull® brass fuel tap overhaul kit for the British Seagull brass fuel taps. This British Seagull® Outboard engine metal fuel tap overhaul kit usually fixes minimal leaks from the fuel tap. It contains the cork washer, a fibre washer, a locating screw and simple guidance sheet. A bench vice and tools will be needed to complete this procedure. 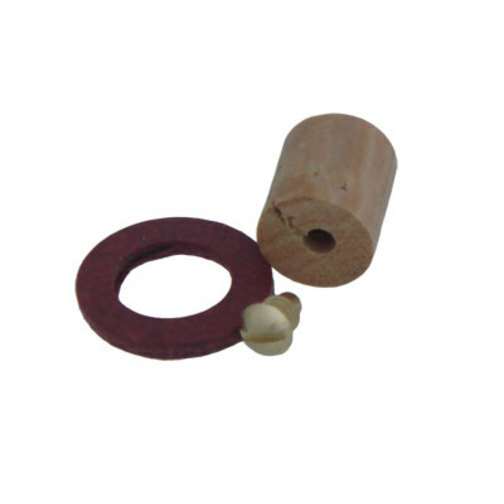 Alternatively, the British Seagull Fuel Tap Plunger has the cork washer already fitted so it is ready to carefully push into the tap body and locates with the screw. Or, the British Seagull Outboard Fuel Tap is the current compete fuel tap that screws into the tank. This part is suitable for all British Seagull Outboard brass/chrome plated metal fuel taps.